The Faculty of Management Studies, DIT (erstwhile DITU) was established in 2004 by launching MBA Program. Currently, it offers 3 Programs – 2 Years Full Time MBA Program and 2 Years MBA in Logistics and Supply Chain in Association with Safeducate and Full Time Doctoral program (started in 2014). The best management college in Uttarakhand, it has full time faculty members with experience of industry and academics and have expertise in teaching new age domains such as Business Analytics and Digital Marketing apart from traditional specializations like Marketing, HR and Finance. In addition, it invites visiting faculty members, who are practitioners from the Industry to bring hands on corporate experience to make learning more exciting. 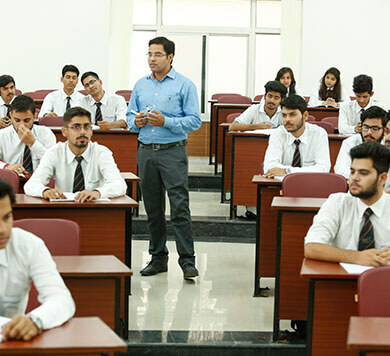 DIT University, the top management college in Dehradun, also organizes guests’ lectures and expert sessions by inviting key people from the industry and academia (reputed institutions likes IIMs). Further, Industrial tours, pleasure trips and value added trainings such as personality development, aptitude building, general business awareness building etc. are also arranged from time to time for the holistic development of the students. The best management institute in Uttarakhand follows flexible credit based courses for diversified teaching learning process and grade based evaluation system for global compatibility.